Ask your cashier or play at a WinStation. Know instantly if you have won! More ways to add a little play to your day! 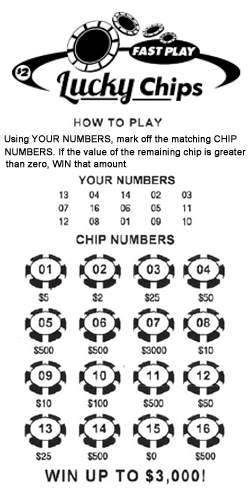 Fast Play games are generated by the lottery machine but play like an instant game. There is no waiting for a drawing to take place; you know instantly if you have won a prize. In the fall of 2012, we began offering multiple Fast Play games with different price points. Fast Play games will be featured in a rotation of four every few months to keep the games fresh and exciting. Visit your favorite Vermont Lottery agent or any of the 100 WinStations (our ticket vending machines) located throughout the state to get the latest Fast Play games. Prizes under $500 may be claimed at any authorized Vermont Lottery Agent location. Any prize amount may be claimed at Lottery headquarters in Berlin, Vermont. Overall Odds of winning a prize vary with each new game. Just follow the directions on each ticket to see if you’ve won. Remaining prizes, including top prizes, are subject to the number of tickets distributed, sold and redeemed.